"41CE12-192, Burial AH-17" by Timothy K. Perttula and Robert Z. Selden Jr.
DECORATION (INCLUDING MOTIF AND ELEMENTS WHEN APPARENT): The rim panel is decorated with single upper and lower horizontal engraved lines. The panel is divided into nine rectangular sections by a series of excised vertical brackets. 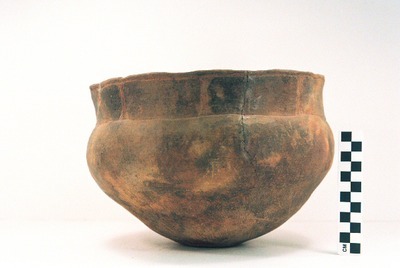 The vessel body has vertical and diagonal brushing marks. Poynor Engraved, var. Hood globular bowl from the Jim P. Allen site.